In such simple understanding that you kind of think, “I knew that.” It doesn’t have to be in complicated language and complicated references that it is meant to go from heart to heart. They teach us from the signs outside to understand the reality inside. From the understandings of the Circles of Association, Circles of Remembrance and the way of purification, as a reminder for ourselves, what I am trying to accomplish by being inspired by the Divine to sit in the Circles of Remembrance. That I am asking my Lord: let me to reach to Your Light, let me to reach to Your Satisfaction, I am begging Your forgiveness at every moment and seeking Your Divinely satisfaction, ” Ilahi anta maqsudi wa ridaka matlub”. Then the understanding of the World of Light, to keep the company of enlightened people so that we may reach a state of enlightenment. 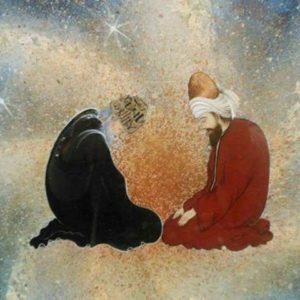 A very simple understanding that even from traditional Sufi teachings Sayyidina Jalaluddin Rumi (q) with a lot of scholastic knowledge and exterior knowledge was lacking, in a sense of the fruit and the essence of the reality. 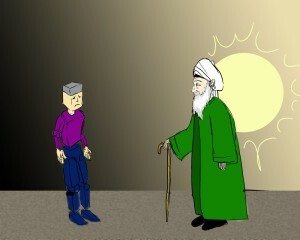 He came across a master in his life, a teacher called Shams Tabriz (q). 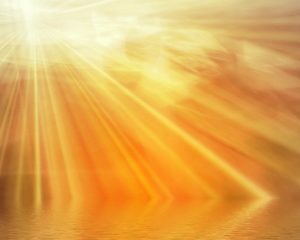 Again for us to make it very simple, shams is the sun and what we have to pull from that understanding is that the sun is a light, an eternal source of light. When we say “light” are we talking of a fluorescent light? 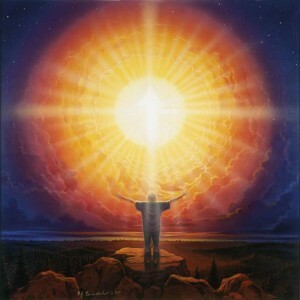 The Divine is saying, “No, look outside in your creation, do you see that sun?” It is eternal. 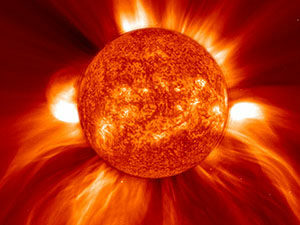 The Sun is in constant fusion, a very clean energy and eternal, no source of energy that we understand. 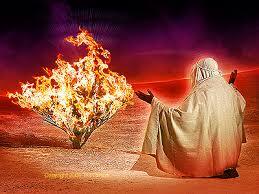 The Divine has its reality, but it is taking from elements and bringing them in and creating a fire, tremendous fire. As a result of that fire, it is emitting a tremendous light. That light when we begin to understand and study the sun it is a source of our breath, a source of our food, a source of our sight, it is a source of our life on this planet. 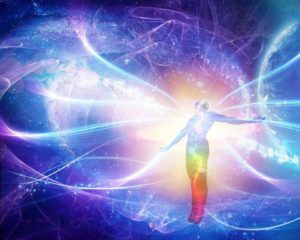 No doubt the originator of the entire source is the Divine but, the Divine is teaching that through means of creation, you are existing. So one sign of your existence is that sun. Without that eternal light you cannot exist, you cannot breathe, you can’t eat, you cannot see. This means for us we are asking to open the reality of that sun. 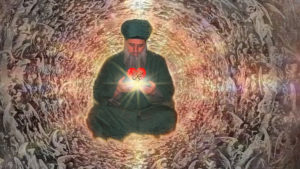 Then the tariqas (spiritual paths) come and begin to teach: the sun and the understanding of the sun is the reality of the heart, and how to open the reality of the heart. 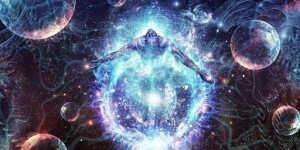 One reality is the understanding of the masters, and then the most important reality is the understanding of ourselves. Masters, their hearts are suns. 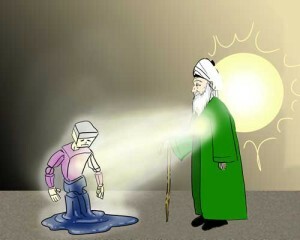 Now how they became a sun is in the understanding of the student. We are trying to sit in the presence of a fire, and that fire is not like a regular fire, but is coming with an eternal Divinely flame. 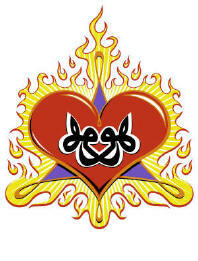 So then the circles of zikr (remembrance), the real circles, with real servants of the Divine whose hearts are open, they have either a tremendous open heart or they have merely a pilot light within their heart, and immediately can be ignited and begin to emit a flame. The importance of that understanding is to understand that we come like a wet log. These are the phases of the zikr (remembrance), always teaching by analogy, because people don’t understand themselves. So when you speak from analogy you get more of an understanding. 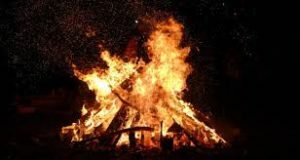 When you come into the presence of a fire and you sit at the fire, the initial stage is that many come as a wet log; they have so much on themselves, so many burdens on themselves, so many distractions within their being. It is like a wet log and when you put the wet log in a fire, it feels nothing. So many come and say, “I didn’t feel anything.” They want us to understand that who knows himself will begin to know his Lord, will begin to know his path, will begin to know what they are trying to achieve. 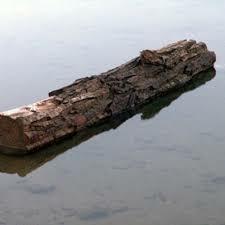 If I am not feeling anything, I am like a wet log. I have lots of burdens, lots of difficulties, again by analogy, I’ve lots of things that are making me in a state of moisture, of wetness, I am distracted. I sit and I don’t feel anything but it doesn’t mean that nothing is happening. That fire is still burning, it is still trying to cook that log but it is going through so many layers of moisture and moisture, and burdens and difficulties, the log doesn’t yet feel it is being cooked. So what they want for us at that stage is to be persistent. Keep coming, keep coming, but we have to know the objective: I am asking my Lord, I am asking to burn in Your Divinely Flame. When you read all the poetry they begin to put all the pieces together, the poetry of the moth, how the moth is attracted to the fire and they want us to be attracted to the Divinely Fire. 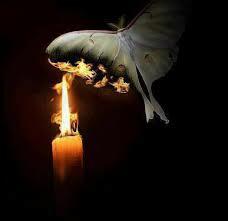 The moth doesn’t think, it just sees a fire and its instinct, Divine instinct is to be lost. When you see little flies and moths back home, they go straight into the fire. The Divine is saying with that ishq, with that love, you must approach Me. 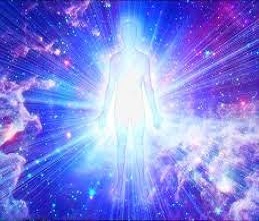 If the outside sun you are in need of, I have “walaqad karamna bani adam” (Quran 17:70), I have honored Mankind beyond the sun and the moon, I have honored the creation of Adam and Eve, I have blown of My Spirit into them. They are more powerful than suns. Forty years of teaching and finally Nabi Musa (as) said, “Let’s go,” and they ran with so much gold they couldn’t even move. That is why they couldn’t escape Fir’aun (Pharaoh). 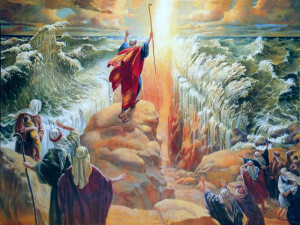 They came with all their gold and all their possessions seeking the promised land until Fir’aun (Pharaoh) came upon them and tried to capture them by the water and the ocean parted and Allah (AJ) saved them on the shores of mercy. But Allah (AJ) had a plan, He told Nabi Musa (as) you go up and seclude yourself with Me. I am going to inspire them to take the gold and make a cow and then I will burn it. So He collected all their gold and manifested their desires that: this is what you like. 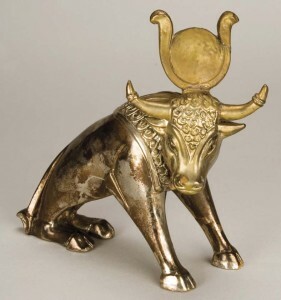 He took all the gold that they wouldn’t part with for forty years, the desires of the material possessions, and Allah (AJ) inspired them to make the cow, that is really what you want. It is a deep reality from Nabi Musa (as) because they are all about the same reality, because he saw his Lord as a burning fire. Then we have to understand our stages. If I am a wet log I don’t feel anything and they are still burning, they are still cleaning until the wet becomes a bit dry. After it becomes dry, it begins to feel that when I go into the associations, into the zikr (remembrance) and I am living this life, I feel a burning. I feel difficulty and testing. I feel trials and tribulations. It means that log is now burning. 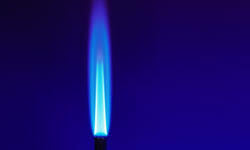 It burns a lot faster the more you come, because you are near a source of flame. That flame is attracted to that wood, it begins to burn, begins to burn and begins to burn it until the wood begins to catch. The wood burns and burns, at that point many people will run. So you see them come and you see them go because the burning and the parting from their material desires, and from their characteristics, whatever is on that wood. Again this is an analogy, whatever is there that they thought they wanted to be burnt away, when the real fire comes, and the real fire begins, many say, “O it’s a bit too hot, I am taking off.” They may even talk bad about the fire on their way when departing. It doesn’t matter. 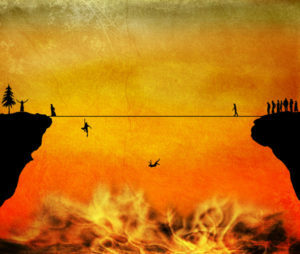 They will be caught in the grave and the burning will begin in the qabr (grave). It is much easier to go through it while alive, much easier to do it in a state of love. That to understand my path and I am asking yaa Rabbi let me to sit in those associations, let me to take a life in which these desires begin to burn and begin to burn. Then they remind us that in science you have three states of matter. 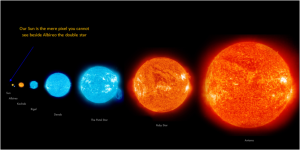 When you come across these suns and we study the suns and the suns have degrees of what suns are. These are again like the Levels of the Heart. 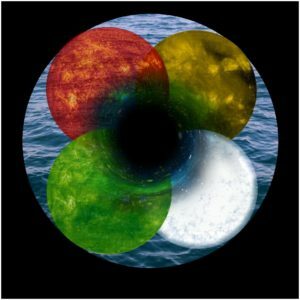 You have a Yellow Sun, you have a Red Sun, then you have a White Sun which they call the ‘dwarf sun’ and then they have a pulsar sun and then you have a Black Hole in the center of the lataif (subtle energy points). 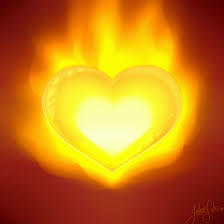 So then they begin to teach: sit amongst them who are open-hearted and they begin the burning process. By burning, burning, burning that wood becomes like hay. From a sense of hay, it becomes almost like a liquid because it has burned so much. The guides begin to teach us that these are the states of matter. That we are at a solid state when we first come, very opinionated, very much into our desires of what we want and what we wish and what we think and what we know and what we have. That has to be burned and they teach us in very basic science, I think in 8th grade science that if this matter is going to transform, you have to leave your solid state. So then you sit, sit, sit, sit until you find your log is becoming like liquid, it burned, it has been tested. 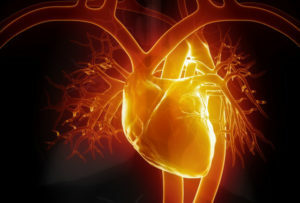 It sits in the flame, literally you go home heating up like you are on fire with fevers and colds and sicknesses over a lifetime, over a period of time not just in one day. 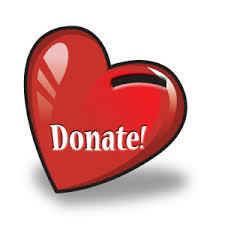 Constantly, this is not only spiritual but physical testing in life, difficulties in life. Then you begin to understand that this is the life of cleansing. Better to be cleansed now than again in the grave. And that matter becomes like a liquid. Then they taught us in science that liquid is much easier to ignite than solid, so the hard part is done. So it means as the student is moving closer to that reality their state is liquid, their state is more easily ignitable to the next state which is gaseous. To make a solid into a gas is very difficult. Solid has to be burned down, has to attend, has to do the zikr (remembrance), has to do the chanting, has to accompany those lights and these suns. When it accompanies, it begins to burn, begins to burn, it finds its character becoming more liquid. Hence lucid, flowing, and less objection, you see the character change. Water, anything you pour it into, okay, there is little bit of a struggle but it goes in, until more fire, more fire, and more fire. 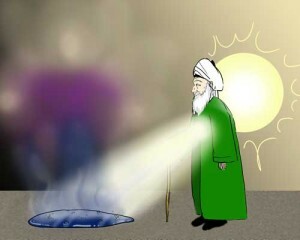 This means as we are approaching the Divine Light, it is the light that Nabi Musa (as) was teaching us. That when you are in a state of love and you are asking to meet your Lord, it comes to you with a flame, this is a flame of Divinely Presence, of Divinely Light and it burns away everything other than that love and you find yourself becoming liquid. Then turning from liquid to gas is very fast. At that state, when the student is reaching a liquid state means their entire being can quickly ignite. They become very sensitive to the energy all around them. They begin to look at the signs in the universe. One sign is that they begin to look at the signs within the universe, you look at the physical sun and see the eruptions on the sun and you begin to understand you are heating up every time you see the sun erupting, that your body changes based on what is happening on this dunya (material world) because Allah (AJ) is saying: you are just a piece of this entire fabric; whatever is happening outside is a reflection of what is happening inside. 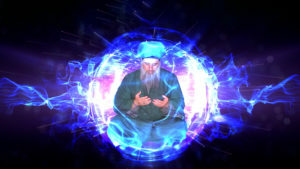 You begin to understand your subtle nature, you are moving from a physical hard nature to a subtle lateef, nature. Subtle nature is like gas, immediately the liquid state ignites to an ethereal angelic state, just a little bit of that light and the soul is moving freely. The specialty of Naqshbandiya is that when their pilot is lit and their lights are on, they have the ability to shut ‘on and off’ instantly. So you may see them as very normal people interacting in many different things but when Allah (AJ) wants them on, Prophet ﷺ wants them on, Mawlana Shaykh wants them on, immediately just their zikr (remembrance), their state of haal (spiritual state) ignites their entire being. They just pass their being through that fire and can ignite their entire soul. Their soul and the size of their soul is beyond understanding, beyond the size of this Earth. The Earth fits within the hand of their soul. 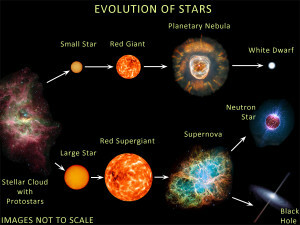 From the level of the sun then they begin to open not regular sun, they move into the understanding of the red giant. The red when we begin to understand, these are huge giant suns. They even have a factory within themselves of what is happening and again the degrees of awliyullah (saints) are unimaginable. There is not just one level. 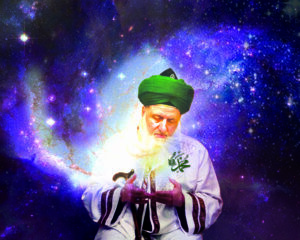 Just for us to understand that when Mawlana Shaykh lights the heart or given permission for the heart to be lit, it is tremendous reality. And because of that reality they are capable of emitting a tremendous light. It means the sun is already in a state of annihilation, it has lost its physicality and annihilated itself in Divine Reality, as a result of losing its mass it is now just energy. What Einstein was trying to understand was that formula of how to reach energy. When they begin to lose the importance of their mass, then their energy is two lights; the two lights squared within them. Then as the degree of their sainthood is elevating, elevating, elevating…, then you begin to study these white dwarfs and pulsars they actually collapse within their reality. Then they become so dense and so powerful that it is unimaginable until the black and the black which is the state of complete annihilation, is the black hole. The black hole means it collapses upon itself but not only it collapses upon itself but anything it approaches, it annihilates it. 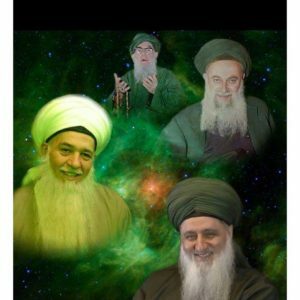 These are the big saints, their duty is merely to bring every body into that annihilation and throw them from fana (annihilation) back into baqa because once you are annihilated and destroyed in that presence, you will be resurrected in the Divinely Presence. These are the stations of awliya (saints). Can You Take the Heat or Run Away? These are the chain and the understanding of these saints. Each one above are much more powerful, each one above with a completely different understanding and duty. To reach to these awliya and to understand that I am asking to sit in their associations I am asking to burn. Then let the burning begin. Many people as soon as the burning begins, they run because they can’t take the heat. They say if you can’t take the heat, get out of the kitchen. That is the cooking because they want to take us to a station of light. InshaAllah with more understanding that Mawlana Shaykh opens for us and that Allah (AJ) grants us an understanding Prophet ﷺ grants us an understanding of the magnificence and the munificence of the Divinely gift walaqad karamna bani adam. The state of light and the understanding of light is beyond imagination. It is beyond what we can even understand of what Allah (AJ), the Divine wanted to give to us, but in exchange what we are actually choosing. We are choosing the worst and the lowest of this Creation. We are not seeking the Light but seeking everything of the material world and losing our state of light, and our understanding of light. 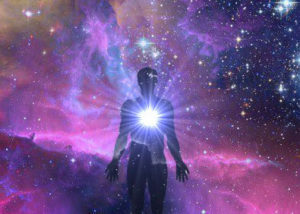 Every technology we have around us is based on energy and light. We rely more on that technology than developing it for ourselves. That is what shaytan wants. The bad ego wants that you just play with the phone, to believe in the phone but don’t ever think that you are more powerful than that phone, that your heart can move from here to the universe to the seven heavens in the blink of an eye, it can send videos, can send signals, can send audio. We pray that the understanding begins to open more and more within our heart inshaAllah. Subhaana rabbika rabbil izzati `amma yasifoon wa salaamun `alal mursaleen wal hamdulillahi rabbil `aalameen. Bi hurmati habeeb al-Mustafa wa bi sirri surat al-Fatiha.